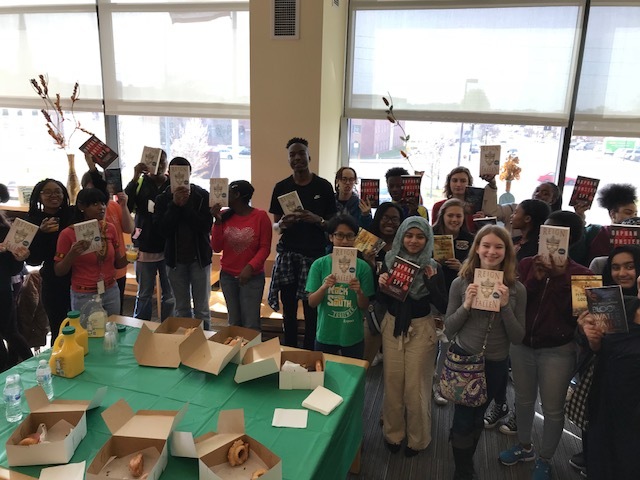 Approximately 50 students at one DeKalb County School District (DCSD) high school prepared for Spring Break by enjoying donuts, orange juice and a shared love for reading. On Wednesday, March 28, Tucker High School celebrated winning a sweepstakes as part of the Penguin Young Readers Teen Book Talk & Party program. As a winner, the school won 10 copies of five books as well as $100 to put toward a celebration in the school library. According to Tucker High media specialist Roberta Barber, the 48 students were chosen by their respective English teachers for achievement in the classroom. Some teachers required students to write a paragraph for entry, while others chose their top students. More simply chose the students because of their love for reading. Barber put the $100 toward 12 dozen donuts as well as gallons of orange juice from the Tucker-based business Donut City. While students chowed down on a wide assortment of flavors, she described the plots of each book. Students had the option to choose from Blood Water Paint by Joy McCullough; A Land of Permanent Goodbyes by Atia Abawi; Boots on the Ground by Elizabeth Partridge; Orphan Monster Spy by Matt Killeen; and Reign of the Fallen by Sarah Glenn Marsh. The books span such topics as LGBTQ issues, romance, war, non-fiction, fantasy, suspense, and drama. Barber said many students asked when they had to return each book, not quite grasping that the books were rewards for hard work, dedication and passion for the written word. She said the event provided an opportunity for students to become familiar with one another and a resource they may not frequently use: the school media center. For Barber, the event was an opportunity to facilitate positive social interaction.